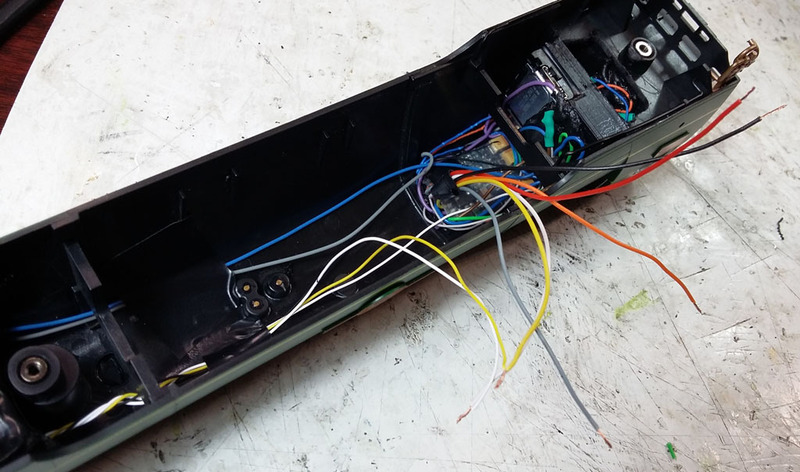 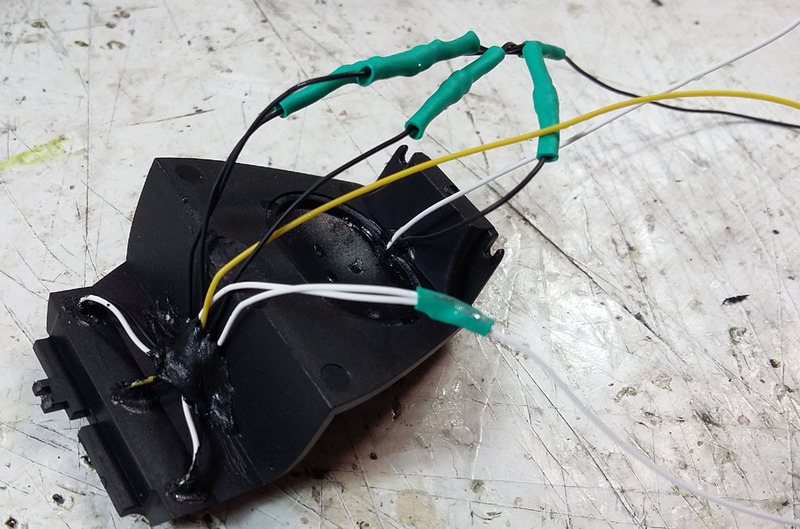 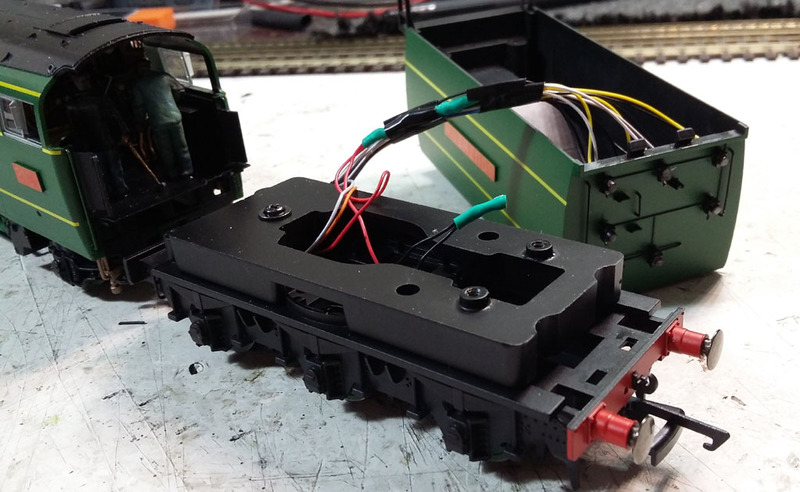 All the gubbins comes out, just joining the existing wires for pickups to the tender pickups and the (now) spare other 2 wires from the connector will be the negatives for tender lighting. 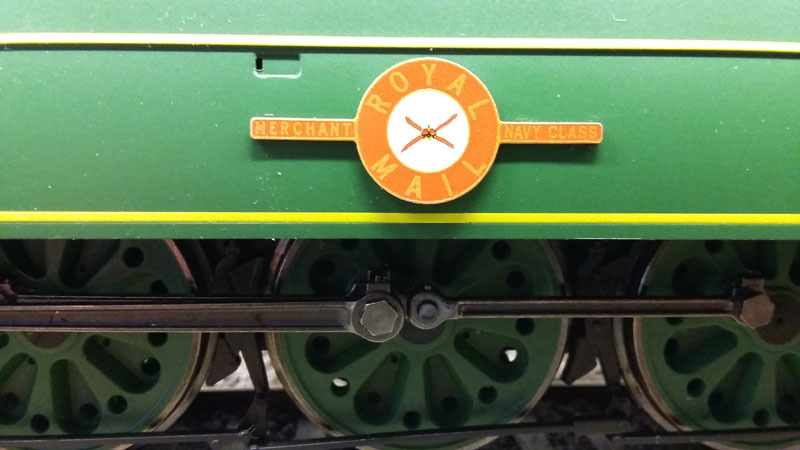 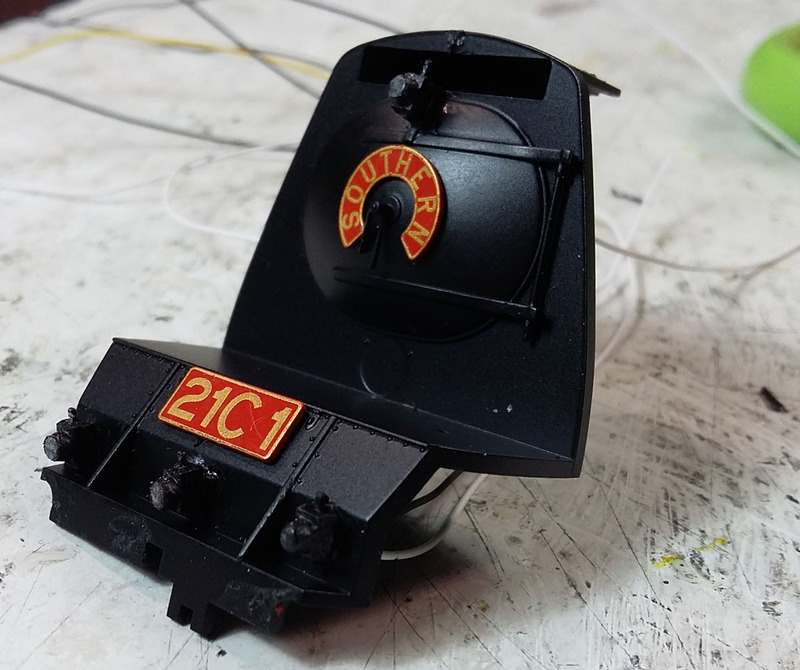 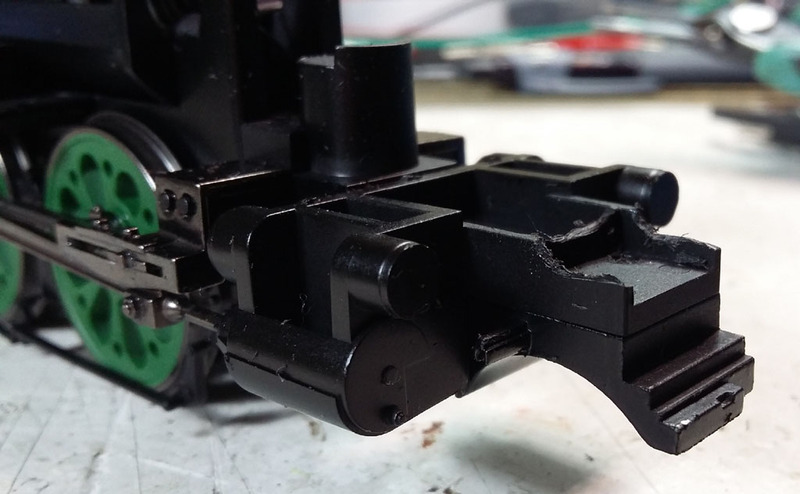 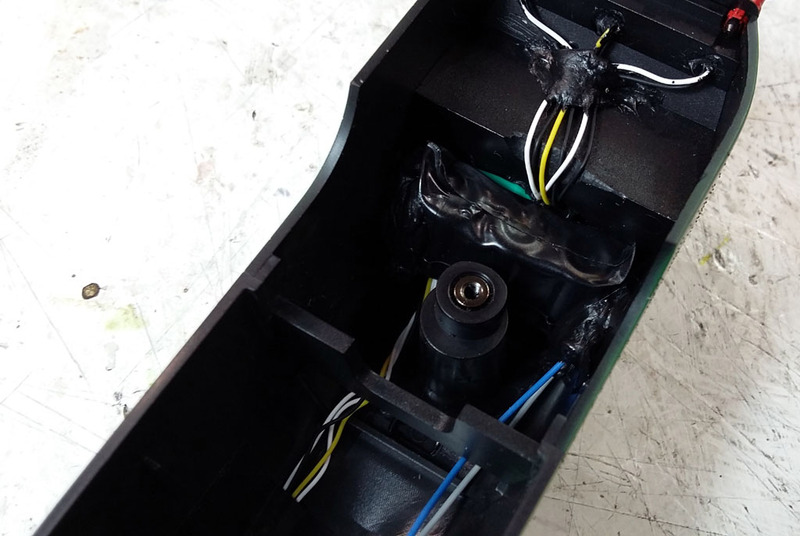 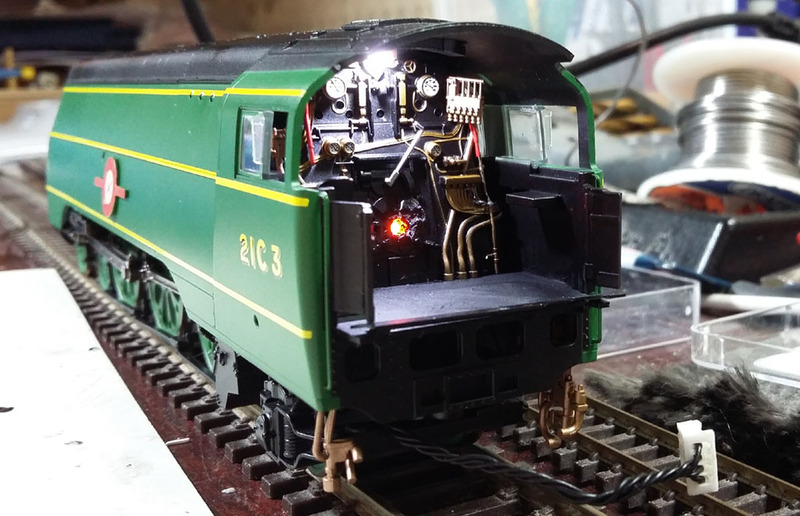 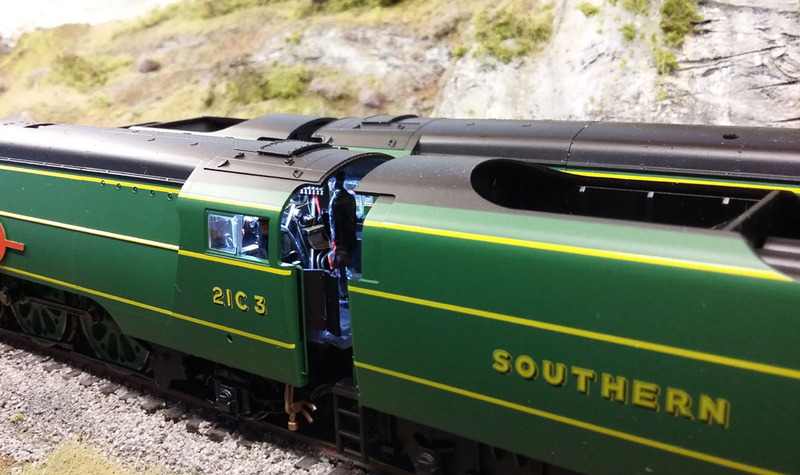 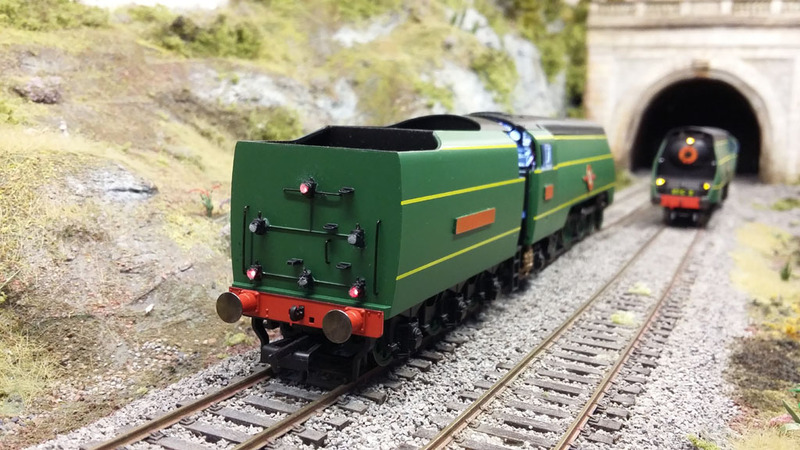 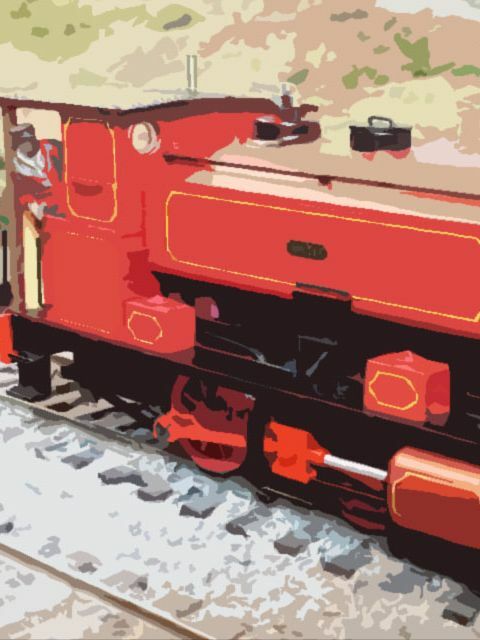 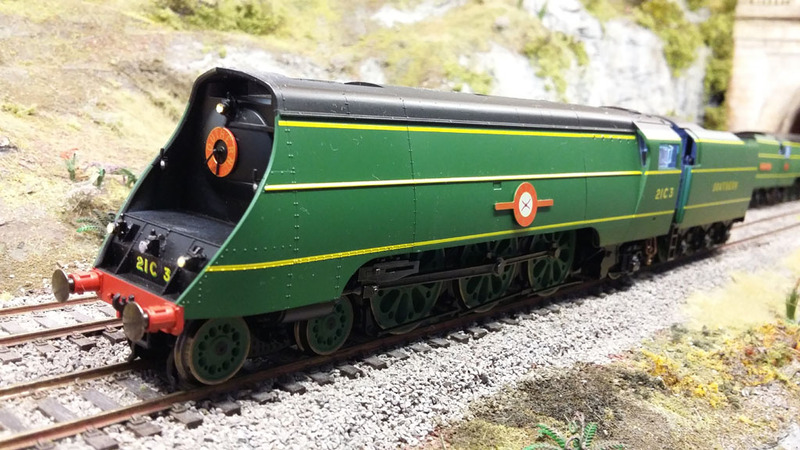 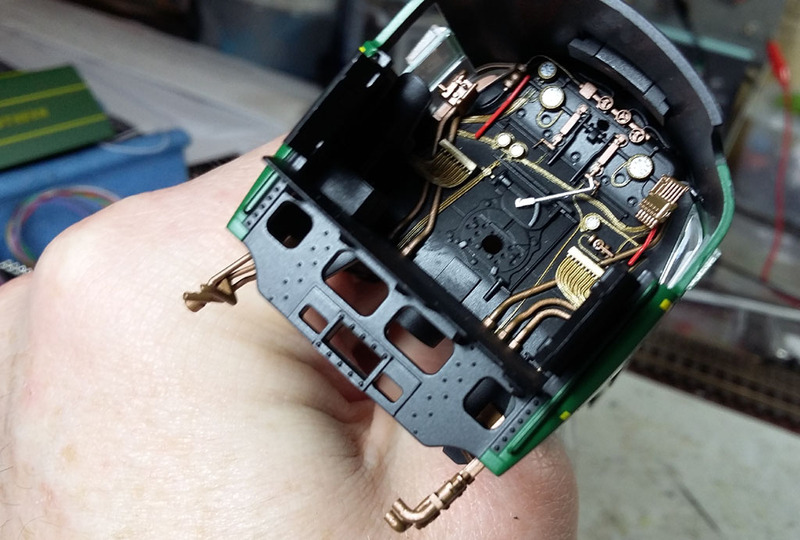 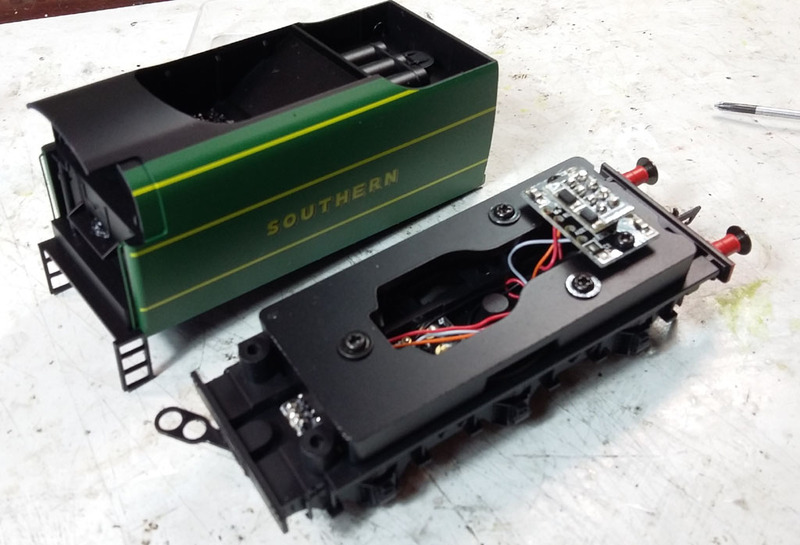 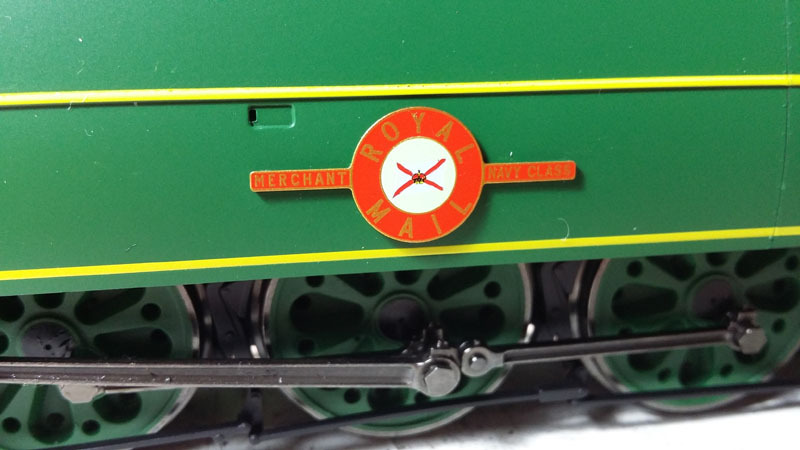 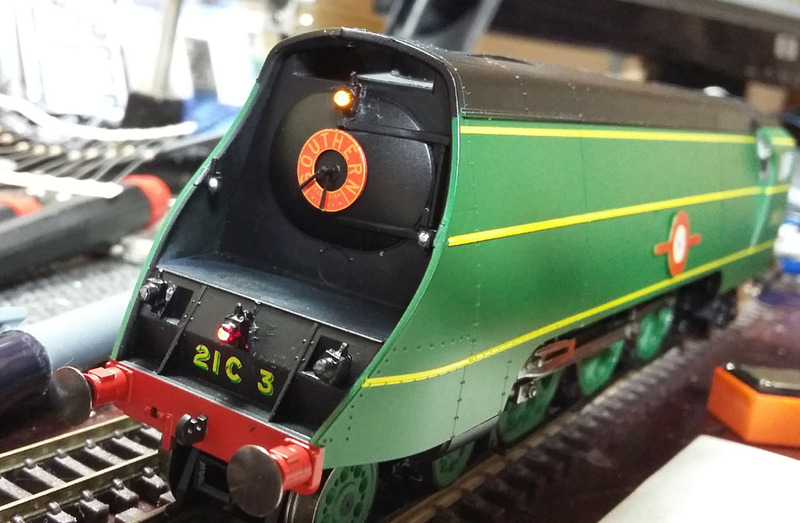 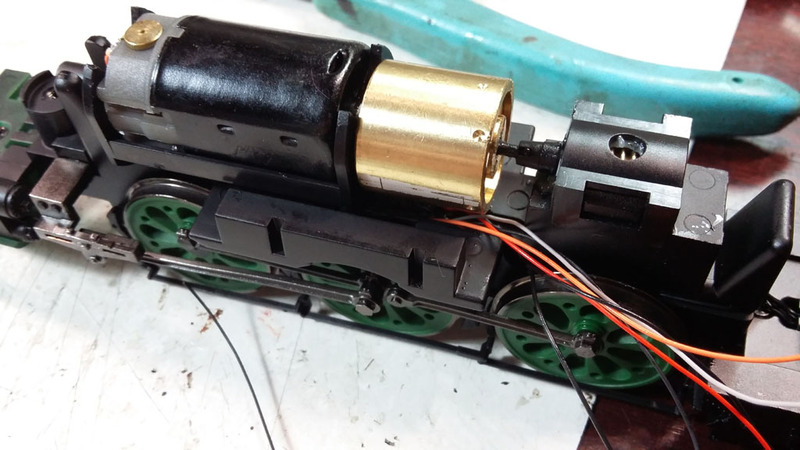 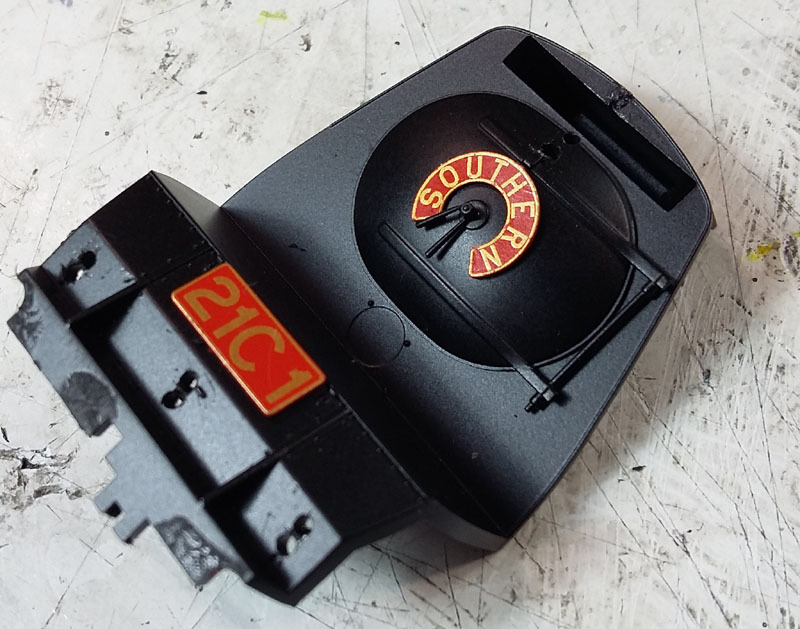 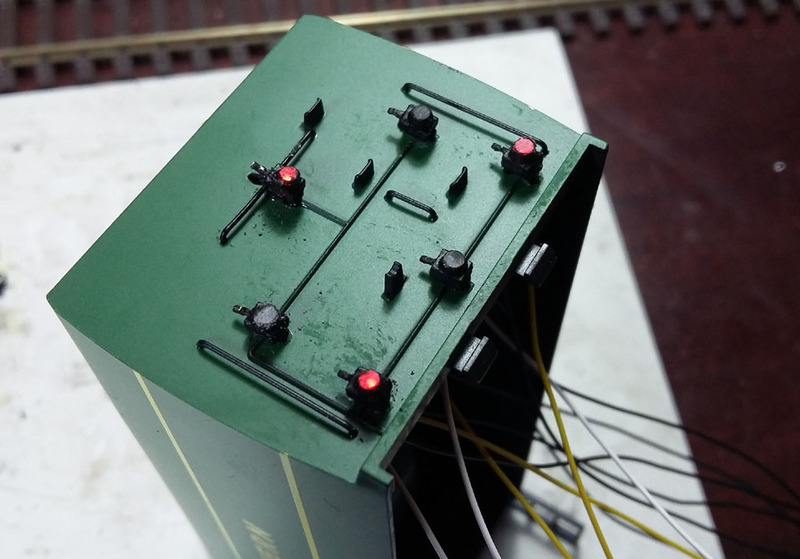 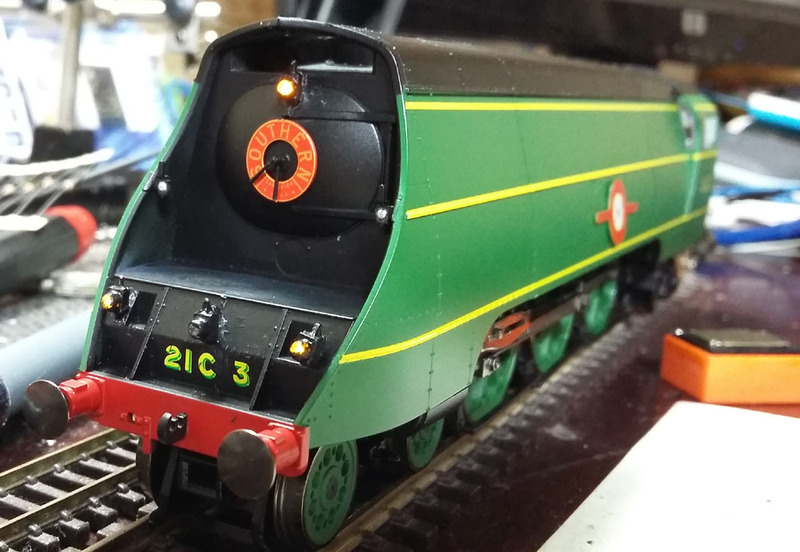 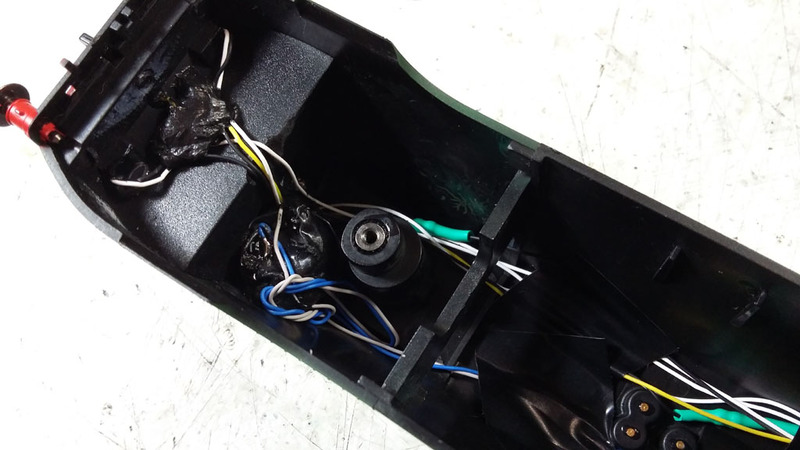 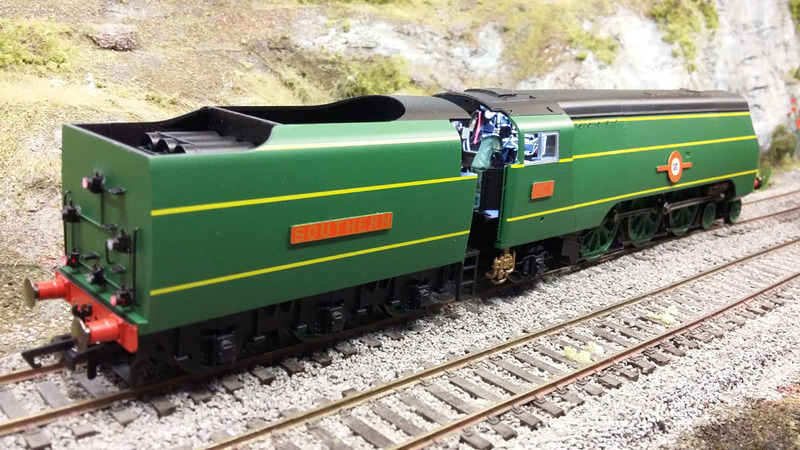 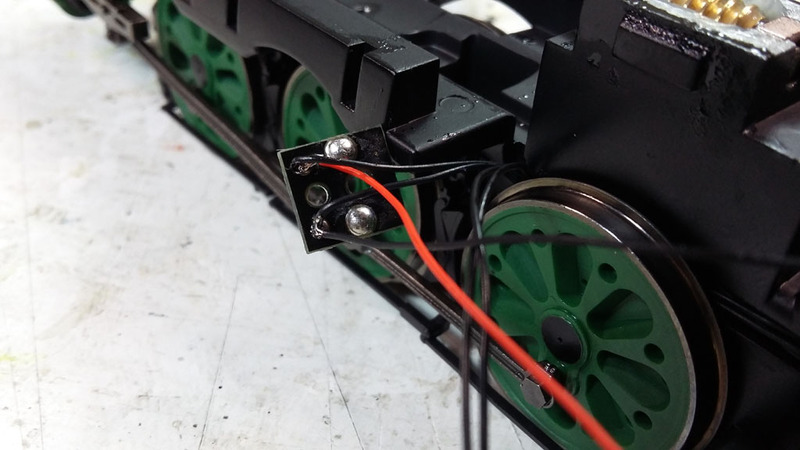 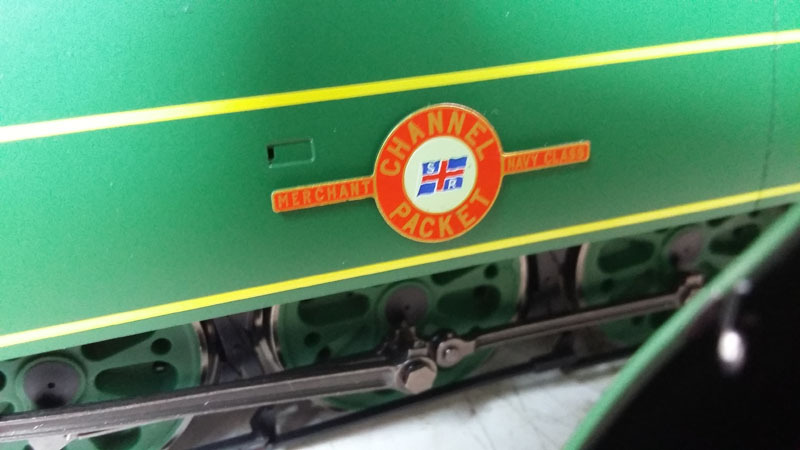 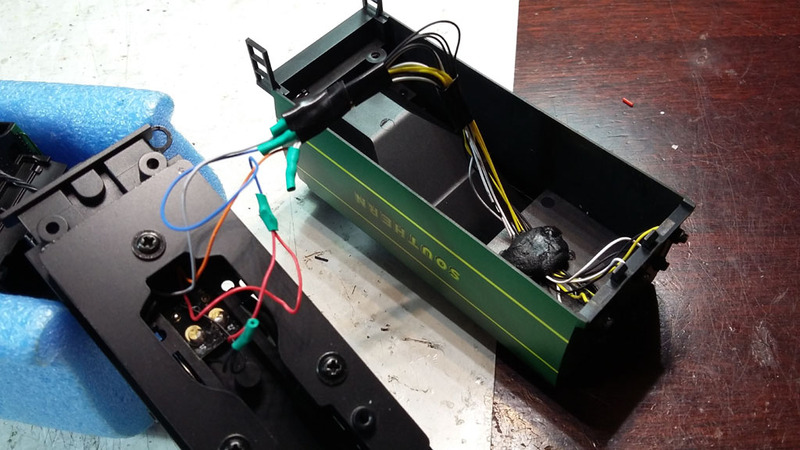 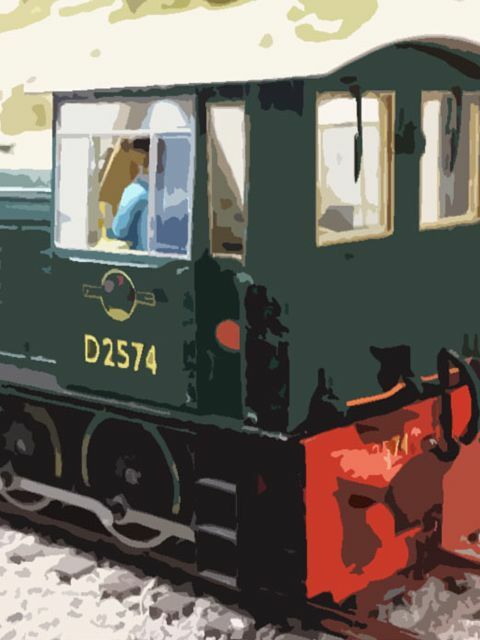 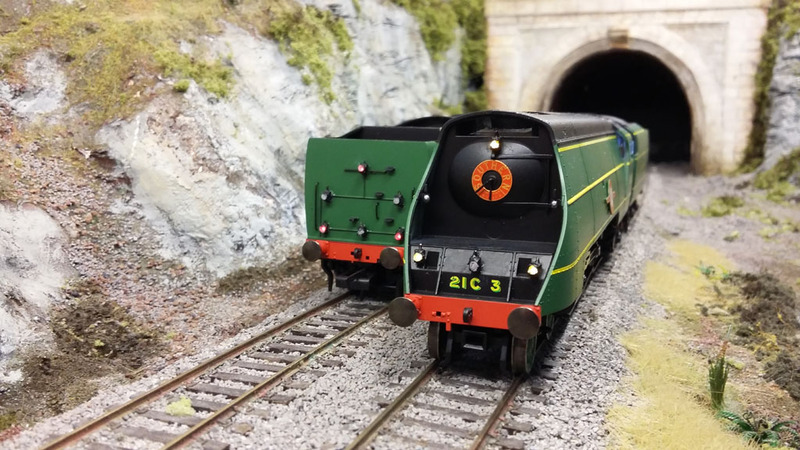 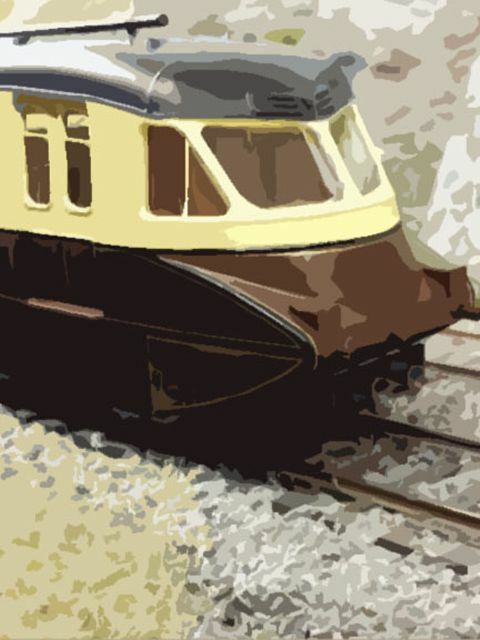 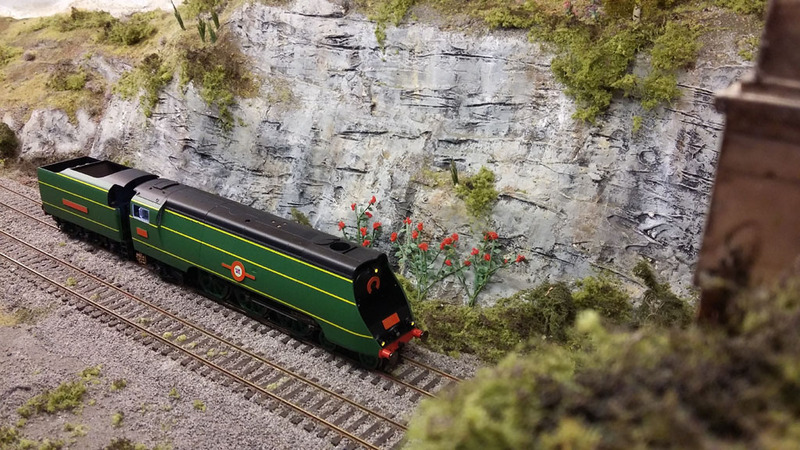 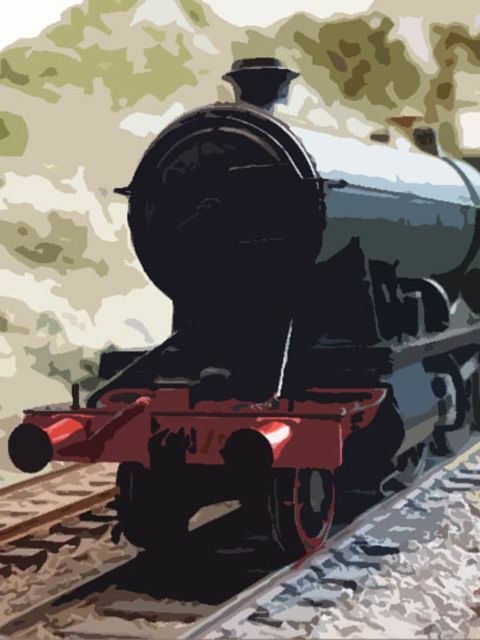 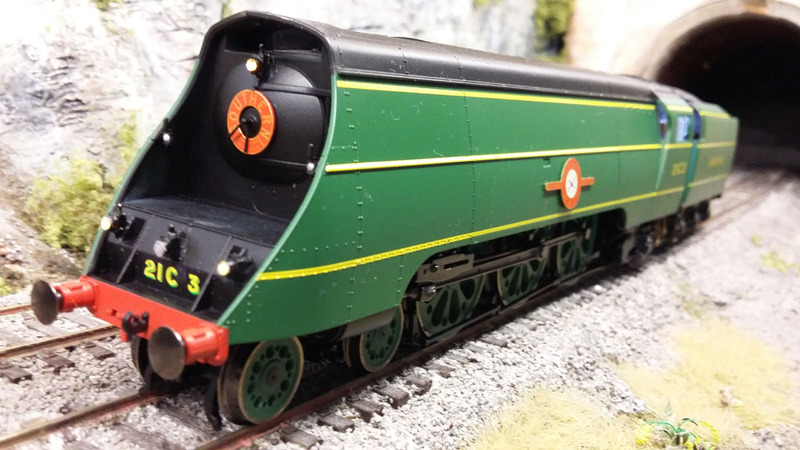 The tender lamps will get their positive connection from one side of the track pickups in the tender, so there is no need to have a dedicated positive wire coming back from the decoder in the loco. 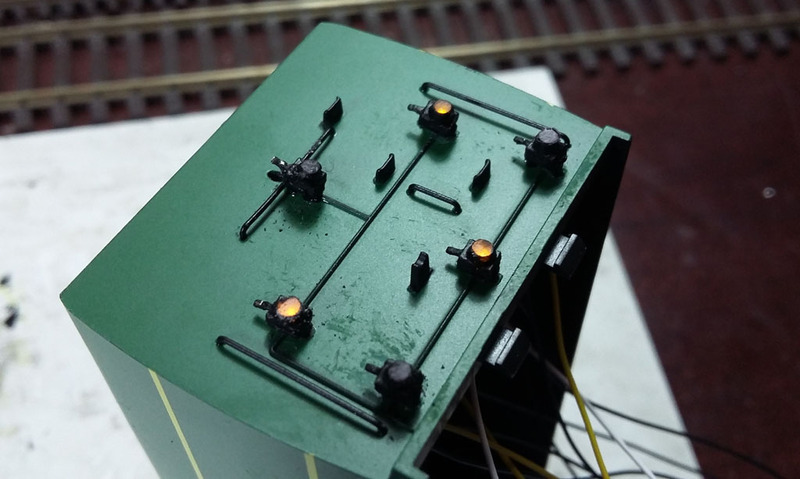 Our lamps are tiny hand-made 1.5mm LEDs. 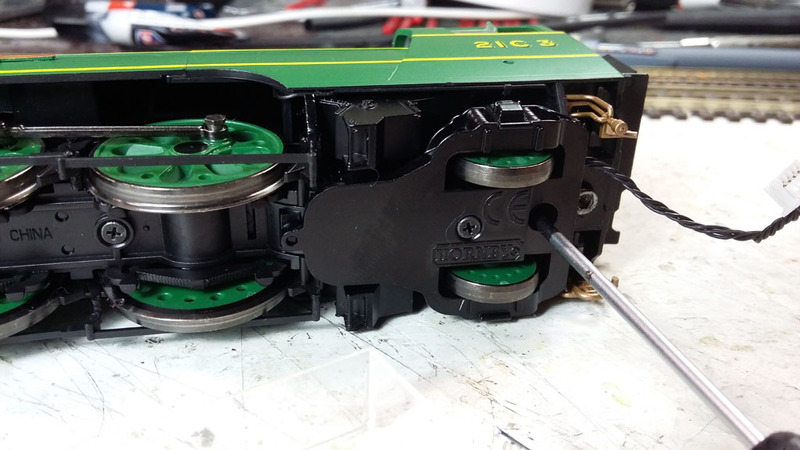 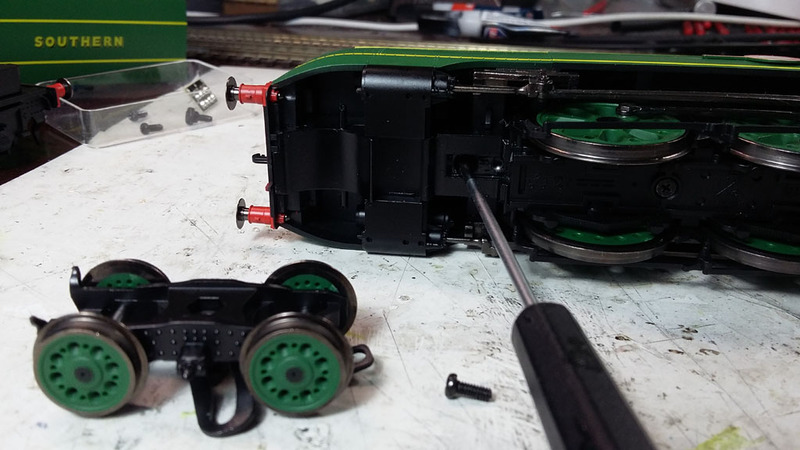 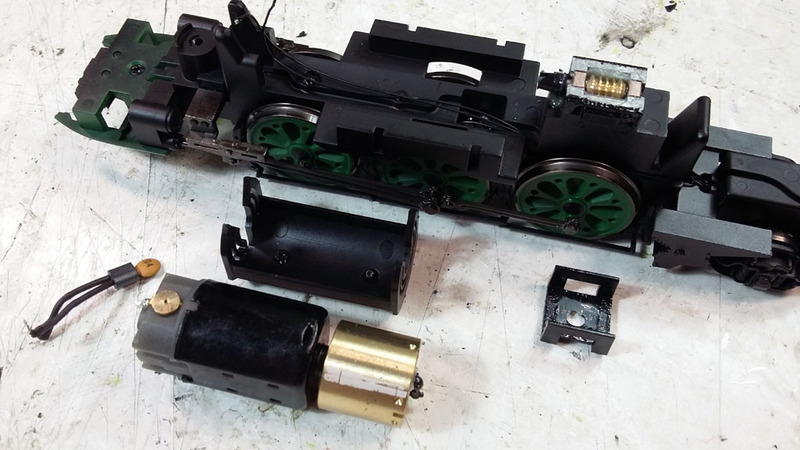 Now to disassemble the loco body - remove the front bogie to make it easier to handle, and the single screw toward the back to allow the chassis to drop out. 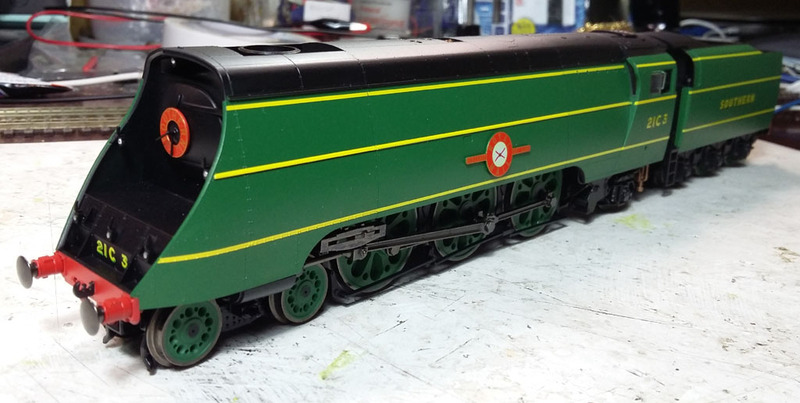 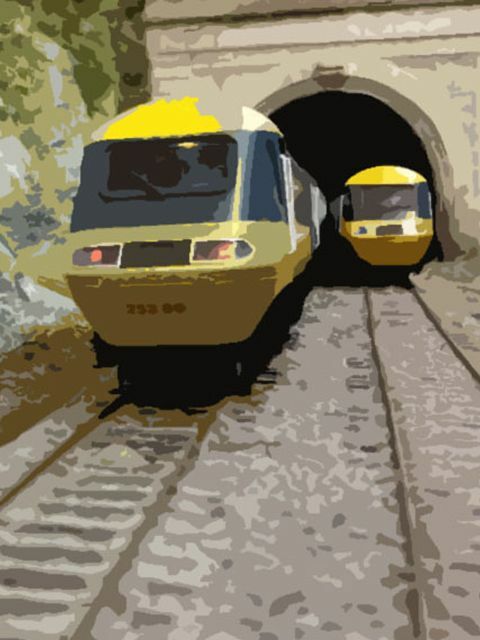 This reveals quite a bit of space available for kit, but not as much as the old Hornby models. 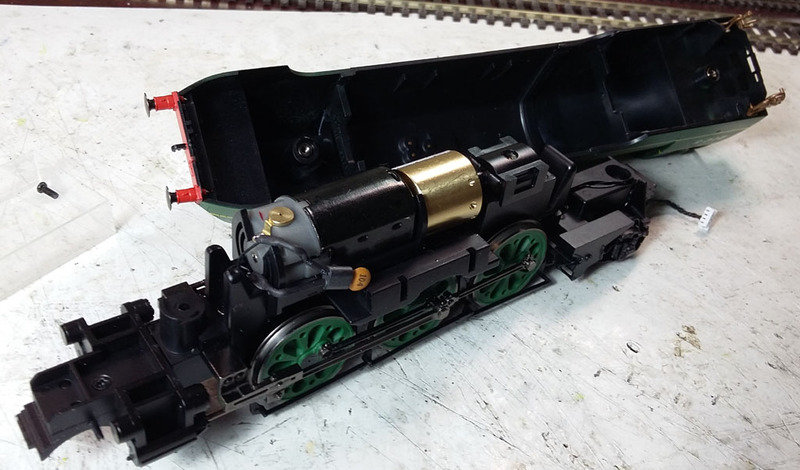 We cannot fit smoke to this model as the body is retained by a screw directly underneath the chimney. 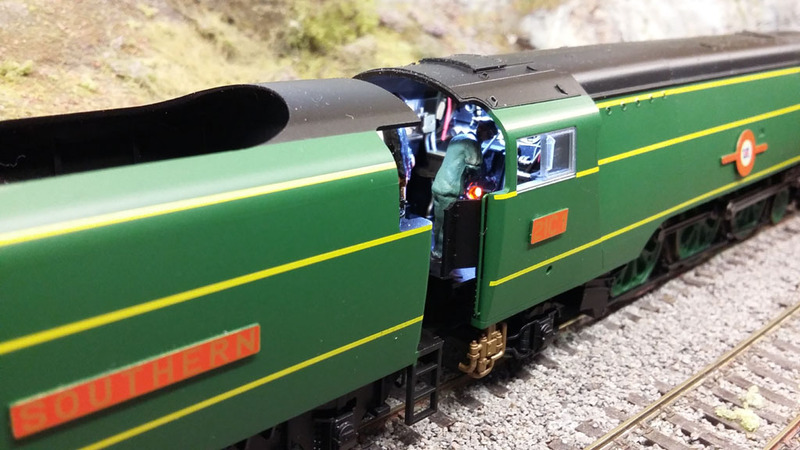 Firebox glow LED first then... drill out the panel behind the bulk-head so we have easy access to fit the LED. 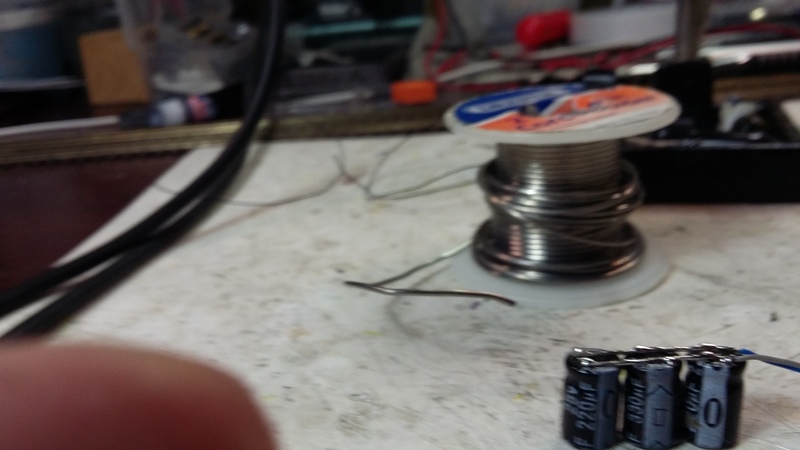 Drill a hole for the LED to sit behind... start small, then enlarge it. 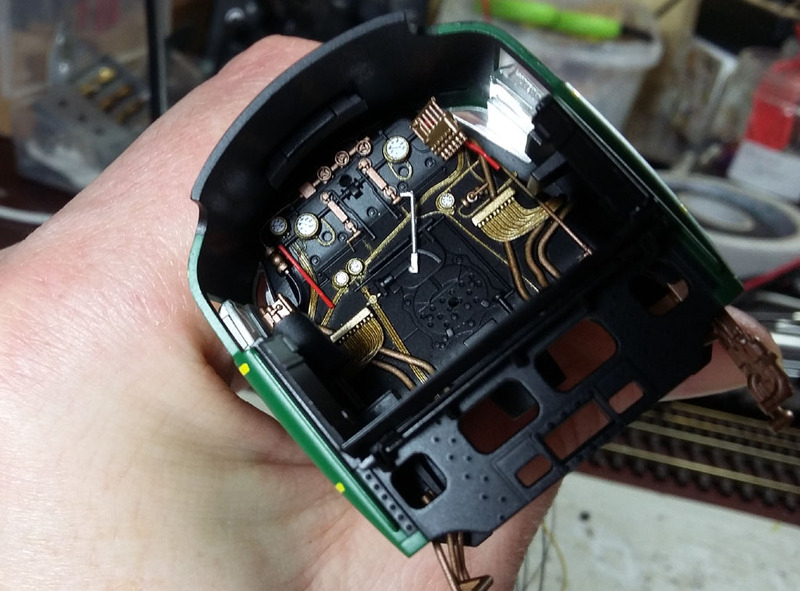 A bit tricky to hold the LED in place while it is glued, so be patient and steady! 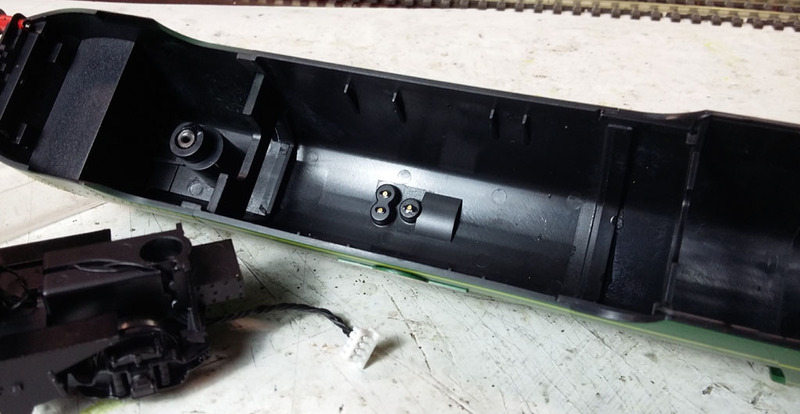 Next, let's work on the front lamps, removing the existing plastic moulded lamps, drilling holes to accept wires and glueing in place, with wires sunk into shallow trenches created with the Dremel. 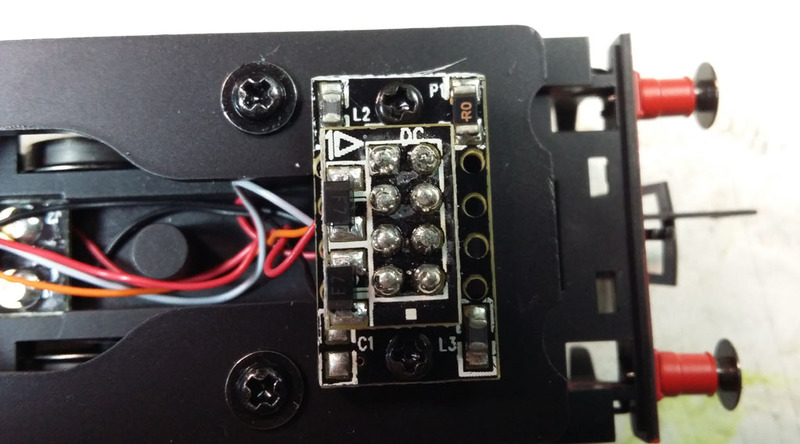 Each group of LEDs that will operate independently must have its' own resistor connected, by convention on the positive side. 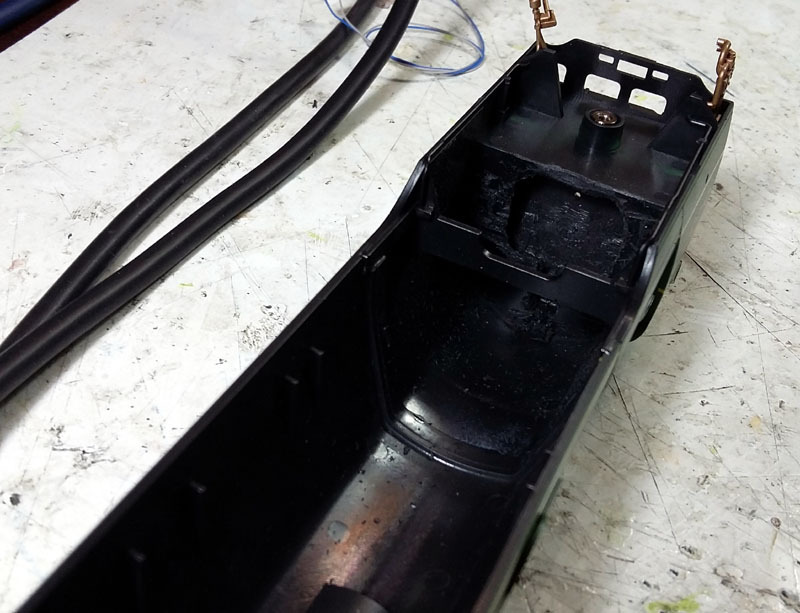 Round off a tiny bit of the chassis front so they don't cut into the lamp wires when reassembled later. 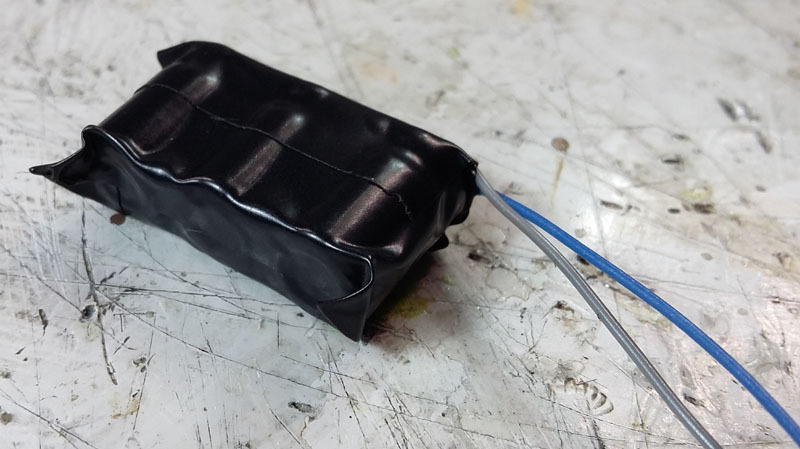 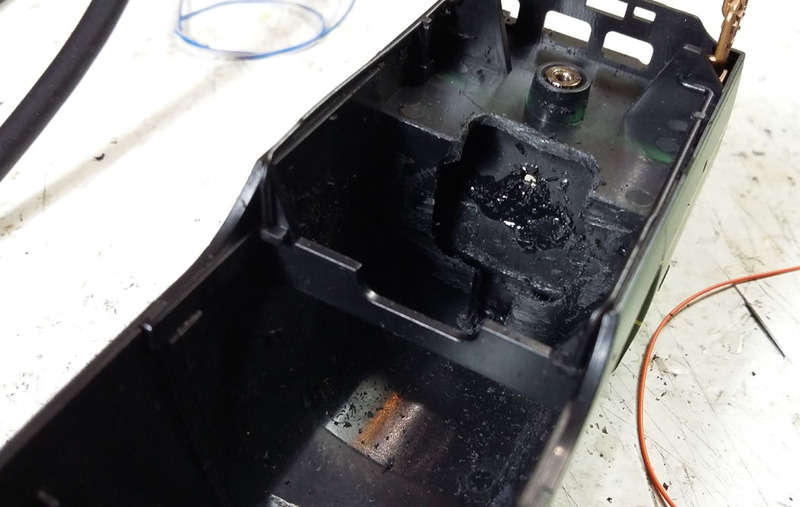 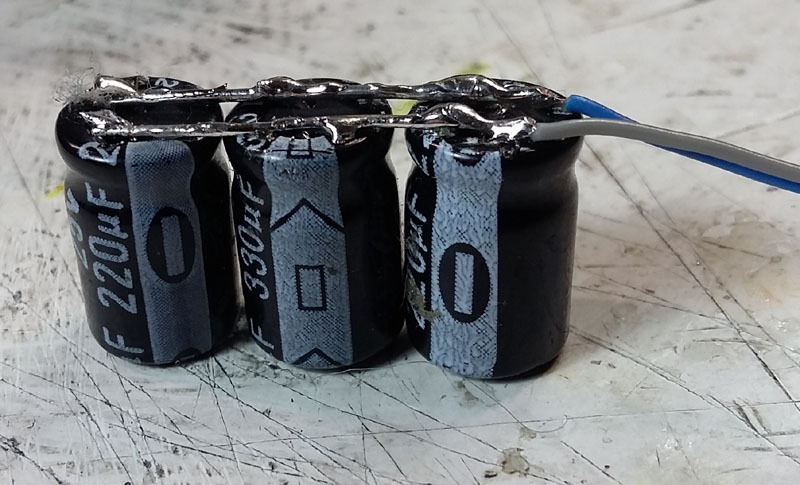 Prepare 3x small electrolytic capacitors in parallel for our stay-alive - we had some 220uF and 330uf caps spare laying around, so used these - total of 770uF is useful, although the model has good pickups anyway, so we don't need anything too spectacular. 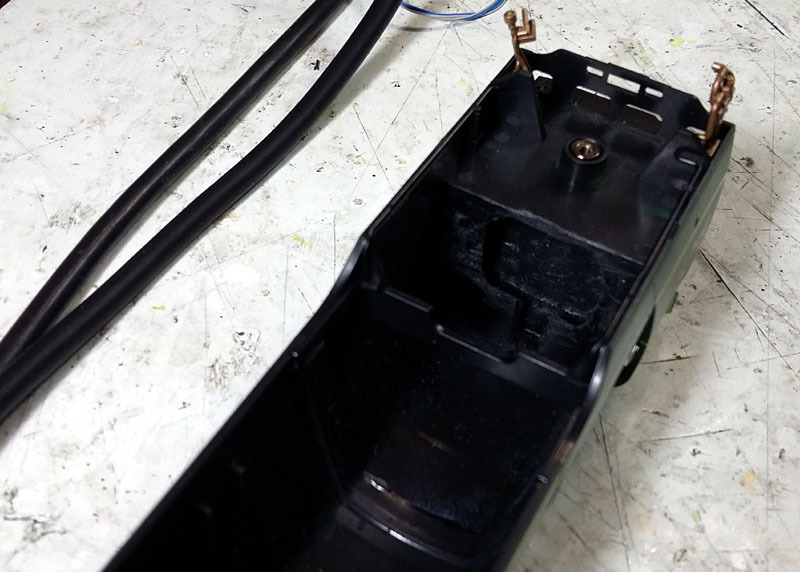 Cover the caps in tape/Kapton and they should slot down in front of the front retaining screw mount. 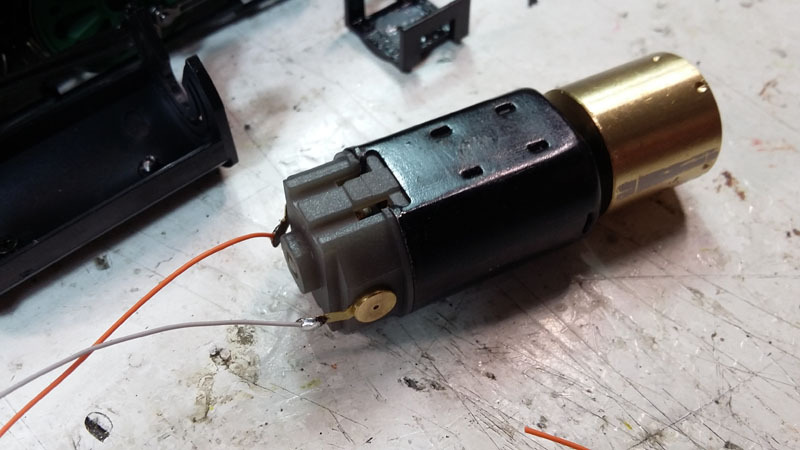 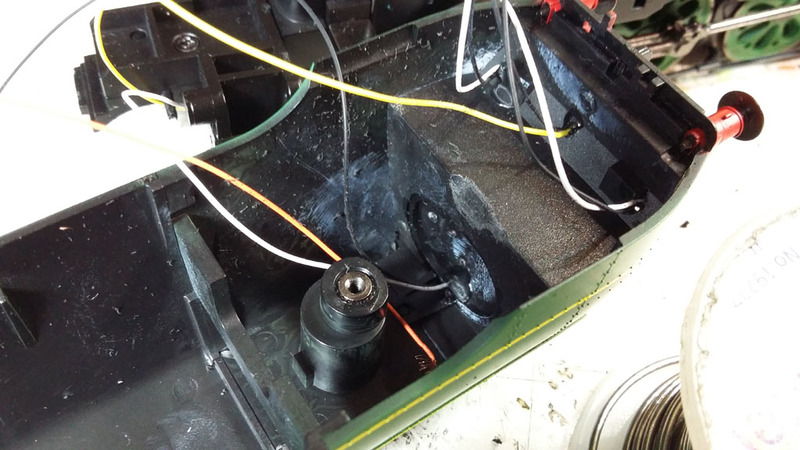 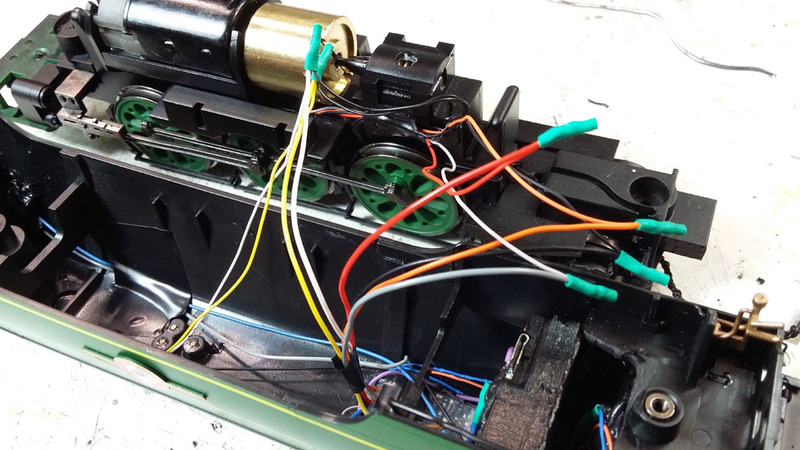 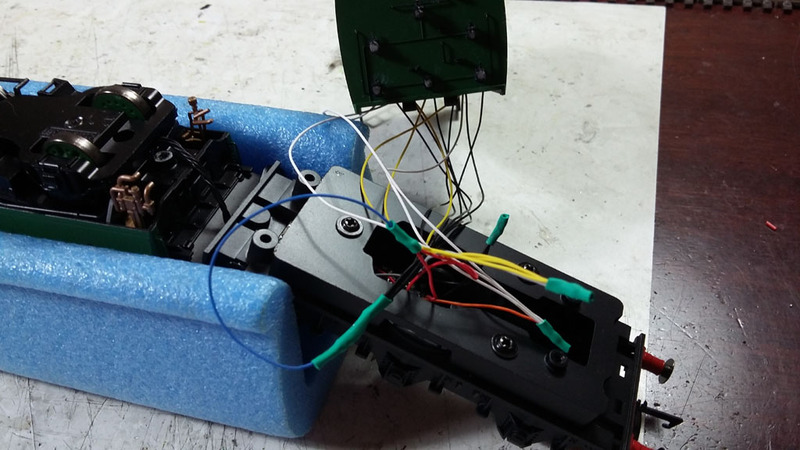 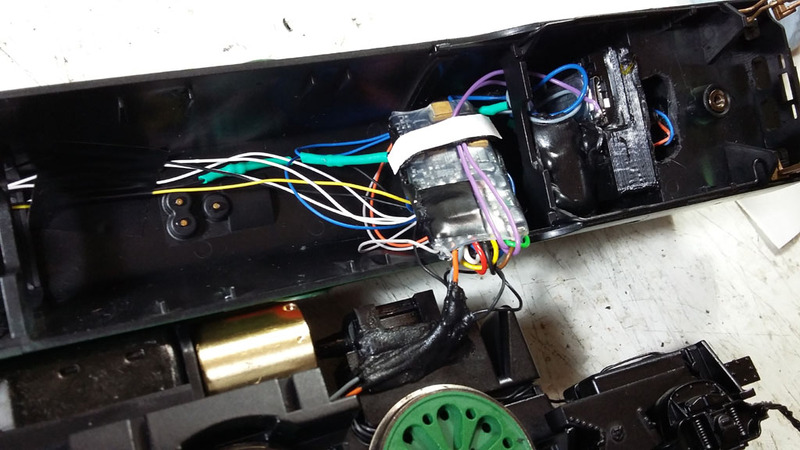 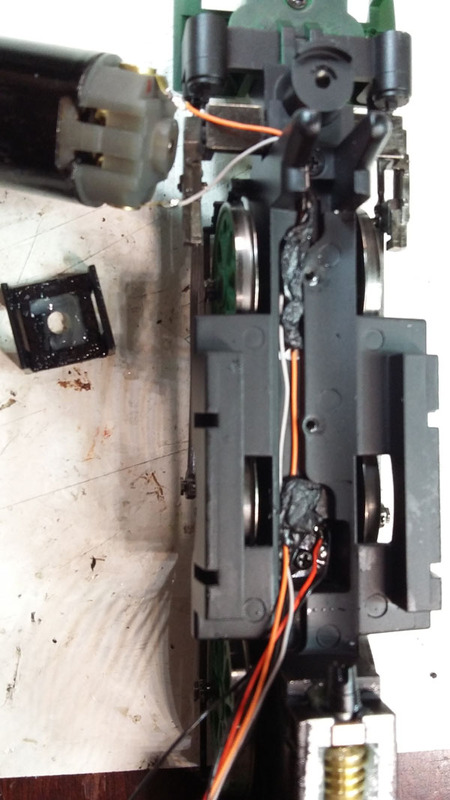 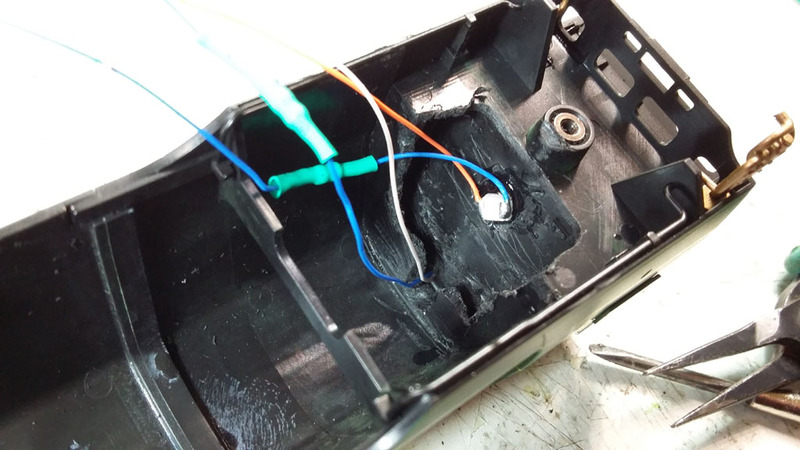 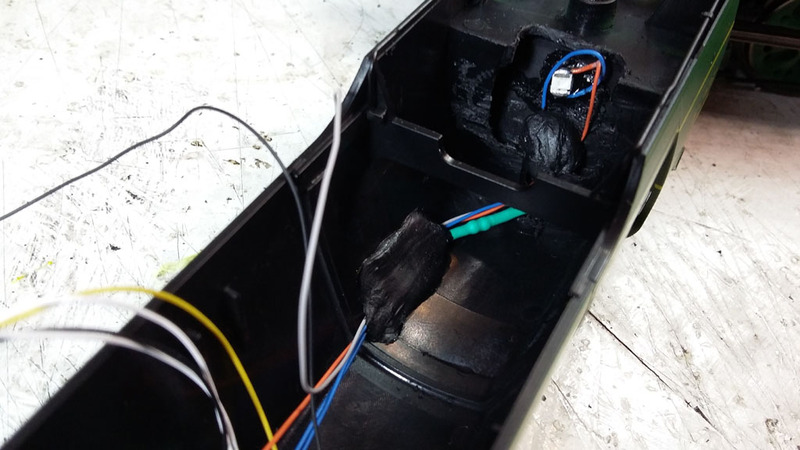 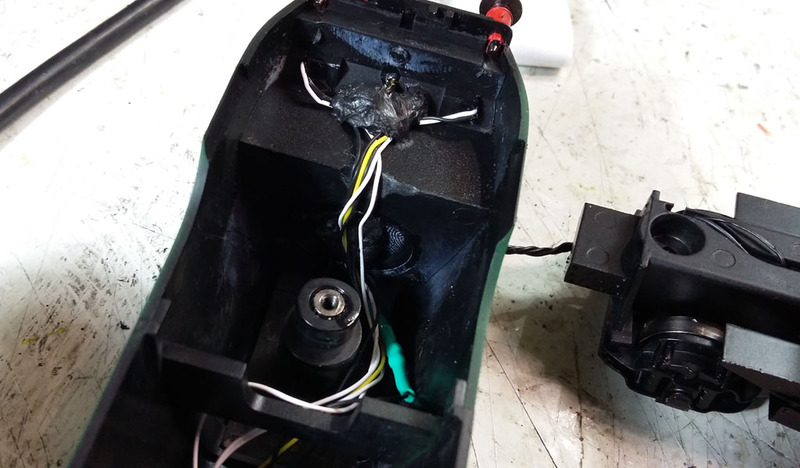 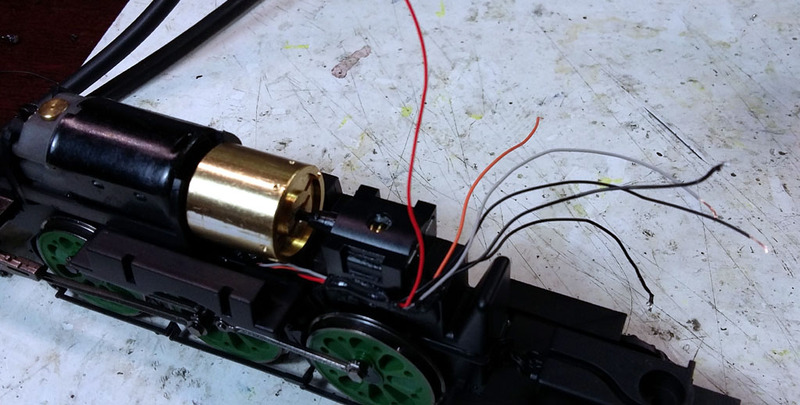 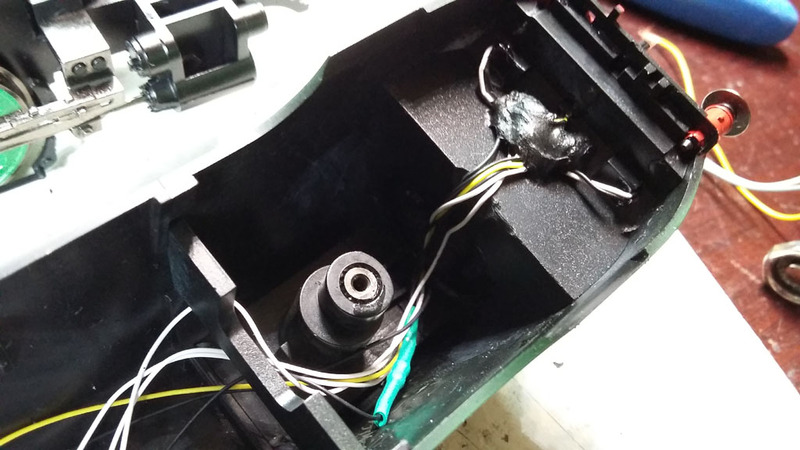 Now we hard-wire the decoder in, which is easiest done by connecting the red+black decoder wires directly to the pickup PCB hidden under the motor, so disassemble the motor by unclipping the worm cover and unscrewing the motor mount. 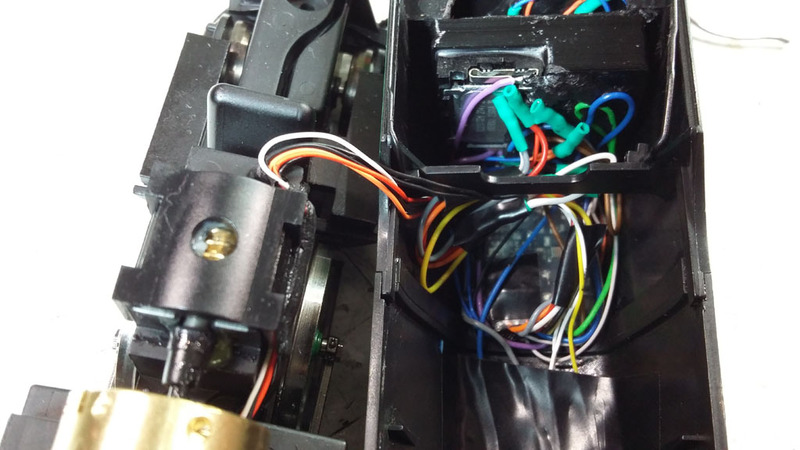 Feed the decoder's orange+grey motor wires underneath and connect at the front end, then reassemble everything. 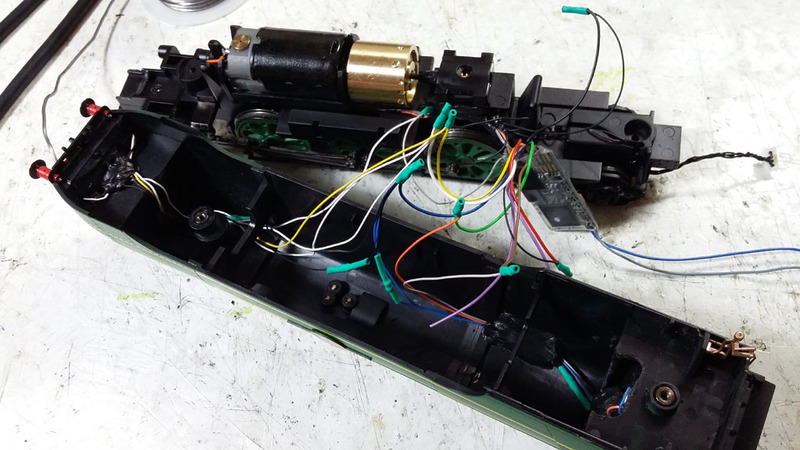 Decoder wires may need to be extended a little to reach. 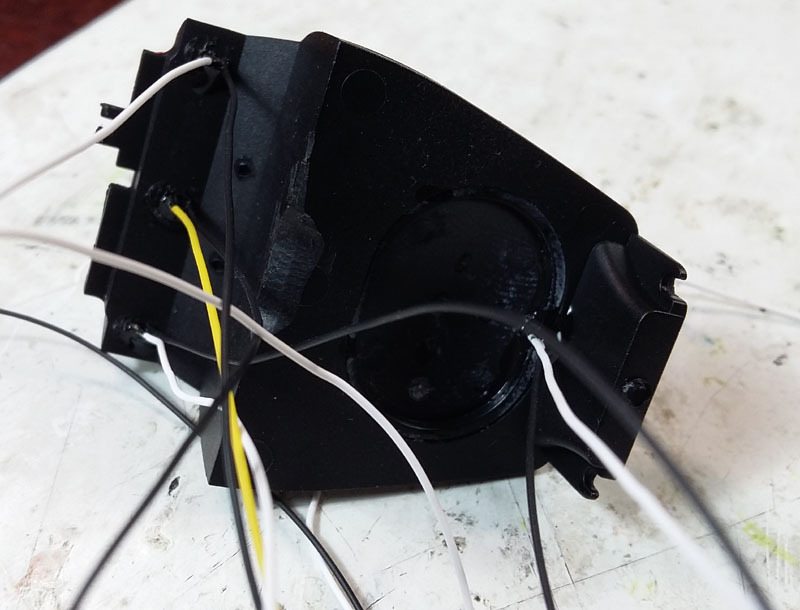 The Dumbo speaker slots in neatly behind the bulk-head. 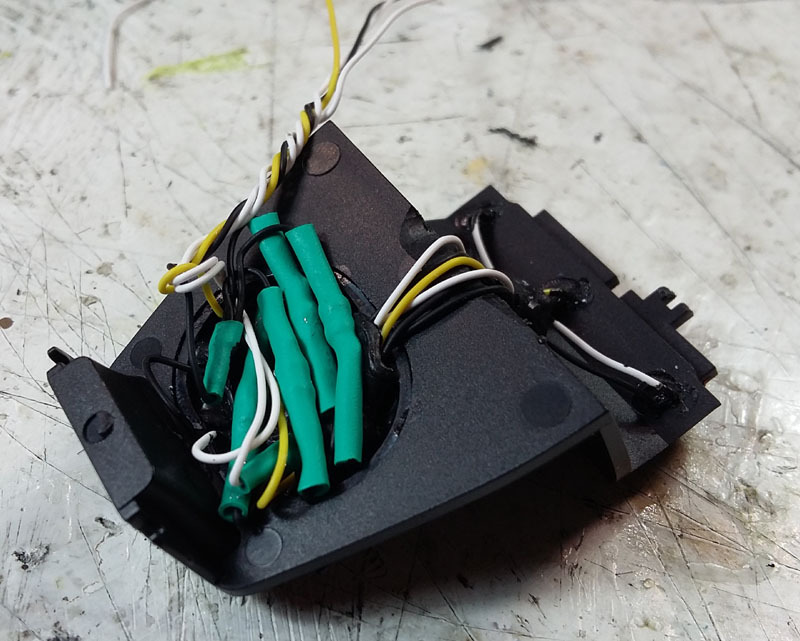 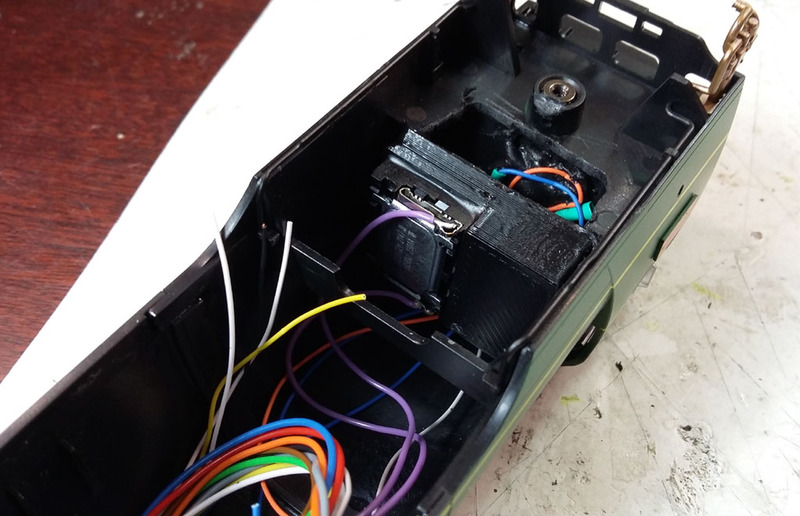 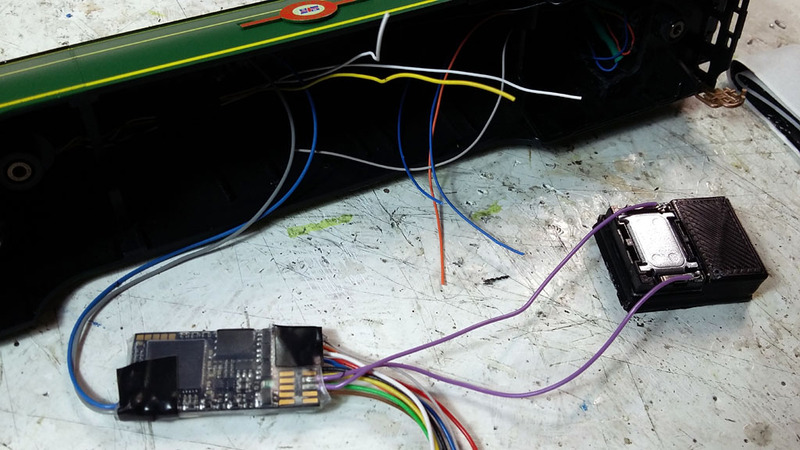 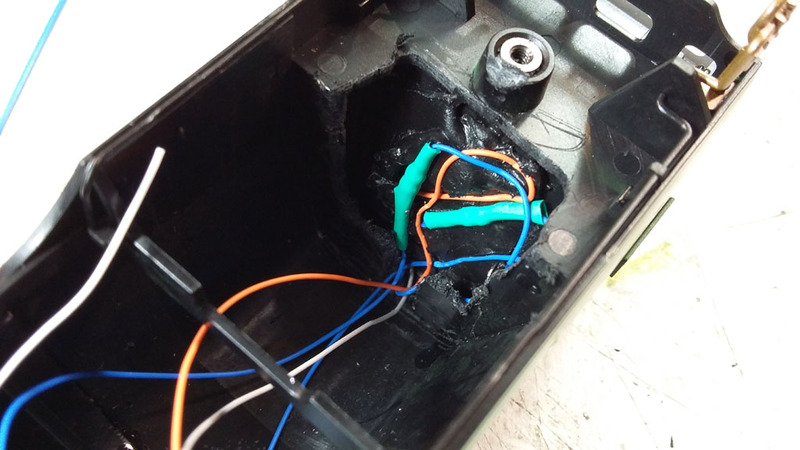 Now to join the spaghetti or lighting wires, including those to the 4pin connector to the tender, tidying everything up at the end with tape and held in place with double-sided tape or Black Tack. 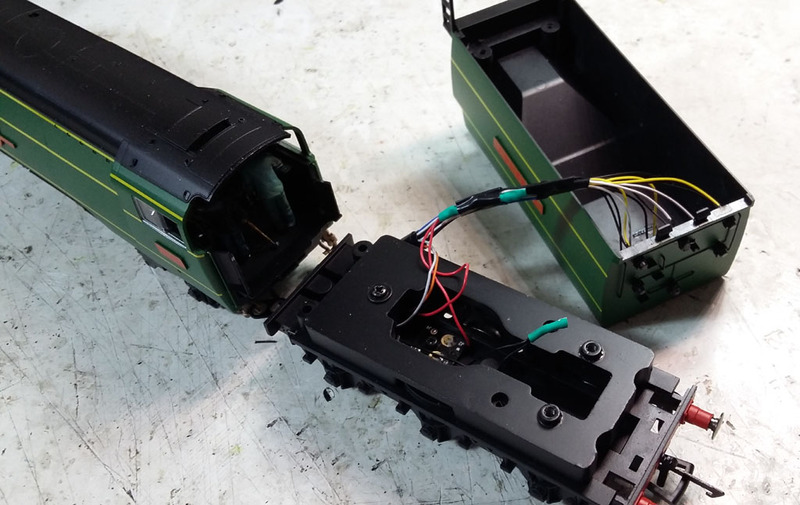 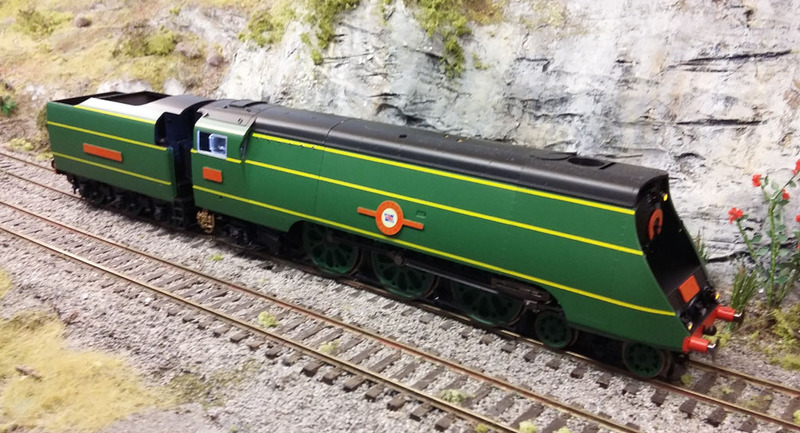 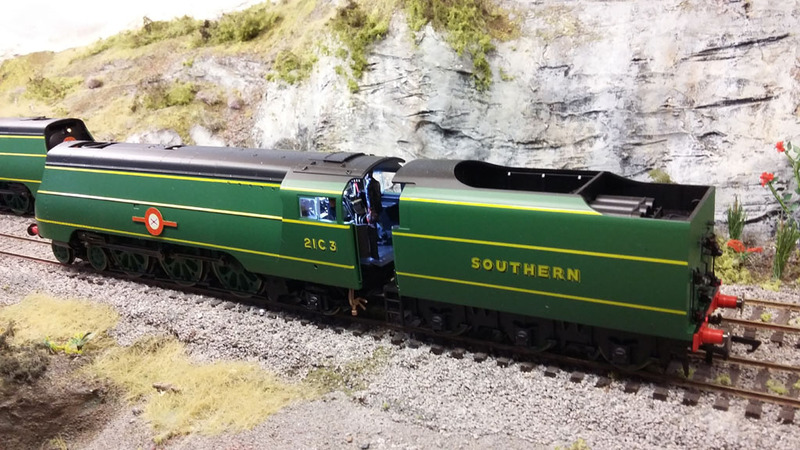 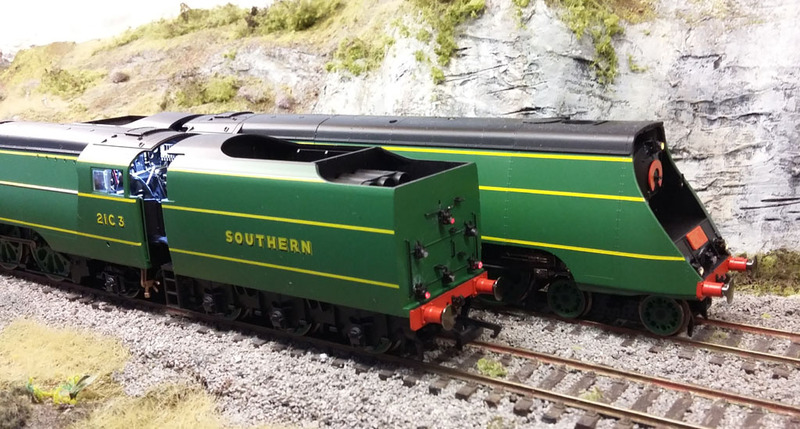 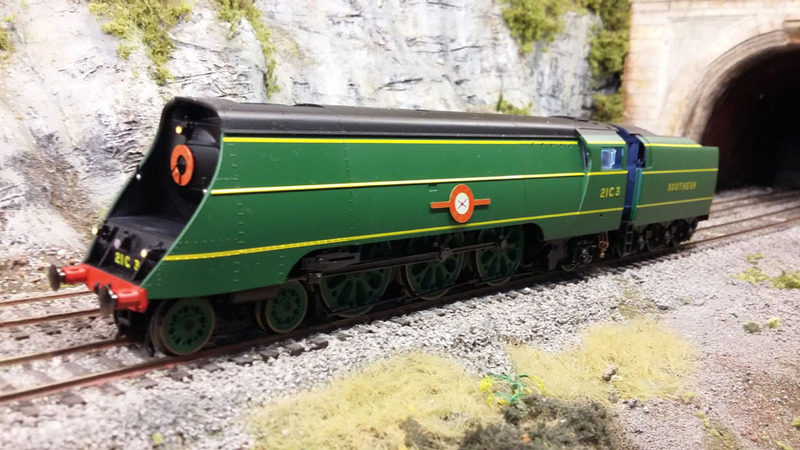 All back together, the loco should operate without the tender, so test everything works OK and you have correct direction.